A classic Mexican-American dish transformed into an easy to make casserole. 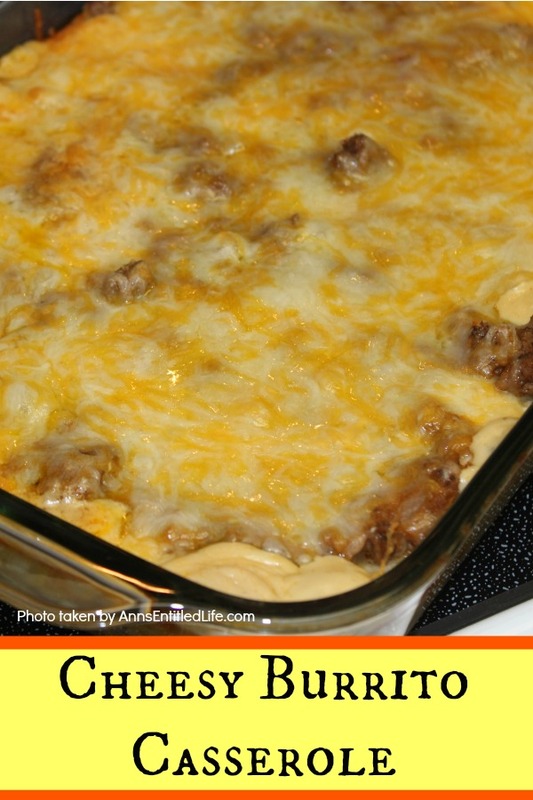 Your entire family will love the cheesy, beefy goodness that is this Cheesy Burrito Casserole. • Brown ground beef and diced onions over medium heat in a large pan. • Add taco seasoning and stir in refried beans. • Mix together mushroom soup and sour cream in a bowl. • Spread half the sour cream mixture on the bottom of a 13″ x 9″ casserole dish. • Tear 3 flour tortillas into medium size pieces, and place them over the sour cream mixture. • Spread half the beef mixture over the tortillas. • Layer 2 cups of shredded Mexican cheese over the beef mixture. • Bake uncovered in a preheated 350° oven for 25 minutes. • Remove casserole from the oven and allow to set 5-7 minutes before serving. • Optional: top with salsa or hot sauce. 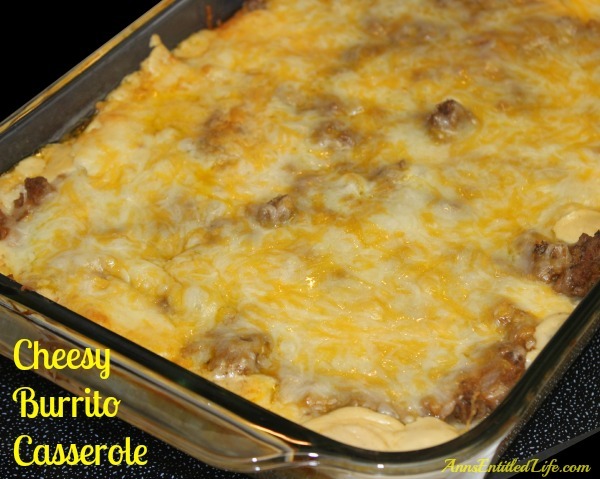 • To print the Cheesy Burrito Casserole recipe click here. So – I am wondering if you have ever made this ahead, then froze it? No, but we have frozen the leftovers, Michelle. That works. Did you ever try to freeze it before cooking? How did it turn out if so? no Melissa, I never froze it prior to cooking. Linda, you need a cream based soup or it will be dry as cardboard. Cream of onion possibly? (You’d have to really like onions though). I replaced the cream of mushroom with cream of chicken, and used pinto beans, and made the top layer the sour cream/soup mixture!!! Turned out way better!! just use mild red enchilada sauce instead of soup .tastes more authentic too ! If you can’t find enchilada sauce stir a packet of taco seasoning into tomato sauce as a reasonable substitute. Do you still use sour cream with the enchilada sauce? i wish i knew how to cook! I have done a similar version without the mushroom soup, but I will now be giving a try to your version. Thanks, maybe this will be dinner today (have to check if I have all the ingredients). Oh yum!! And it looks so easy too. Pinned, definitely going to have to make! Hope you have a fabulous week! Look at all that cheesy goodness! This looks delicious!! Ann, thank you for picking out my dinner for tomorrow. I was so tired of trying to think of something but honey you had me at CHEESE lmbo! Hey Ann – are you using a 9X13 pan here? and what is “medium size pieces” to tear the tortillas into?? LOL – You know i am a novice!!! WELL NOW… that – I can understand!! Excellent!! Making for dinner!! Looking forward to trying this with corn tortillas for my gluten free son. Burritos don’t really taste good made with them, but I think they might work fine in this! I’ve made similar casseroles before but the tortillas always end up being soggy and gross. Anyway to prevent this? Well, these don’t end up soggy and gross. Tearing helps. Now if you had a hard chip, that could end up soggy. I made this tonight. The flavors were okay but the we are texture people and unfortunately they were all wrong. We adults ‘(x3) couldn’t eat it. That being said, the kiddo really liked it. Thanks very much Ann! What if I did the cream of onion soup and left out the 1/2 onion diced? Would that be ok? Linda, I didn’t make it that way, but I think it would be a good idea…otherwise the onion might be overwhelming. YAY! Glad you liked it, Michelle! How was the freezer version?? I just made this for lunch for my husband, 14-yr-old stepson, and me. We all loved it! My hubby is still walking around the house, randomly exclaiming “Wow! That was killer!” haha. I know someone was concerned about the cream of mushroom soup. I just wanted to add that I really despise mushrooms myself. But I feel like once the sour cream and the cheese and the taco seasonings “meld” in the oven, the flavor of the cream of mushroom all but disappears, and just serves to make the whole thing feel way more creamy and cheesey. It was a real hit here. OH–I also added taco rice as an additional layer! Will be doing this on “Mexican night” from now on, instead of laying out an entire buffet of taco components. Thanks! I am so glad it was a hit, Jan! How does this meal cost only $5? The beef alone is $6. Are you considering leftovers for the next night when you say that? Delicious I like burritos, this casserole looks perfect meal. Ok. I am trying this recipe with modification of some things I really like. I added fresh jalapeno and used bush’s mashed black beans instead of refried beans. Also included bell pepper into the veggie mix. To make it a tad healthier, I used ground turkey instead of beef and plain greek yogurt instead of sour cream. Thanks for the recipe idea!!! Absolutely FANTASTIC! Don’t hesitate to make this – exactly as written (unless you like additional jalapenos!). This recipe looks so delicious! Hi, I’m Anita visiting from Think and Make Thursday. I’m making this tonight! My oven is out of commission and was wondering if anyone has tried this in the crock pot? I have not, Bryn. If you do it, and it comes out well, could you please come back with the changes, temp and time? That would be great if it worked! Wow Ann…..Just read all of the comments and I hope you will continue with good ideas and not be put off by Somme of these folks. I certainly appreciate the compliments people paid you. I realize we all don’t like the same thing but good gracious folks, use your noggins to figure some it out your selves or if you don’t/didn’t like it choose your words. Thanks for your contribution Ann. I look forward to trying it soon. I love to see how people change up a recipe to better suit their taste. If you think these comments were off-putting (I honestly don’t), you should see what doesn’t get approve (as downright nasty)! I hope you and your family enjoy this. Kids truly love it (adults seem to be hit or miss).